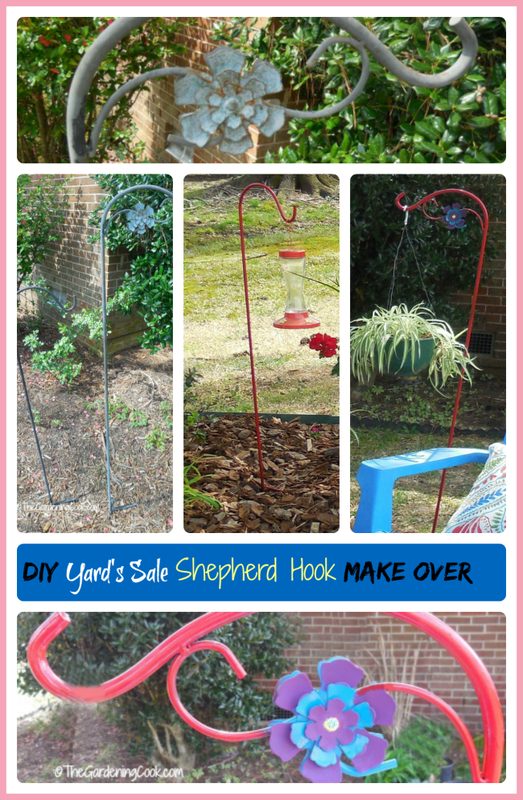 This DIY yard sale Shepherds Hook Make Over Adds Color and Pizazz! I love to go to antique fairs, yard sales and flea markets. There is something really special about finding old things to re purpose or to add to a collection of vintage items. 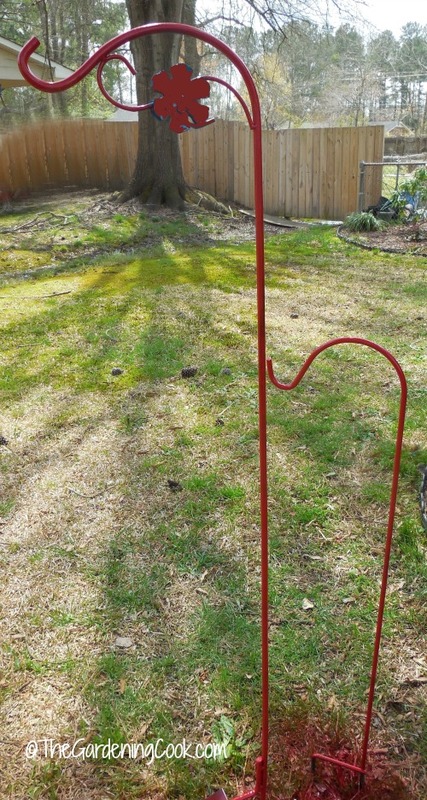 Gardening items are often found this time of the year in abundance. This DIY Yard Sale Shepherds hook make over is my latest project and adds a nice touch to my new seating area. 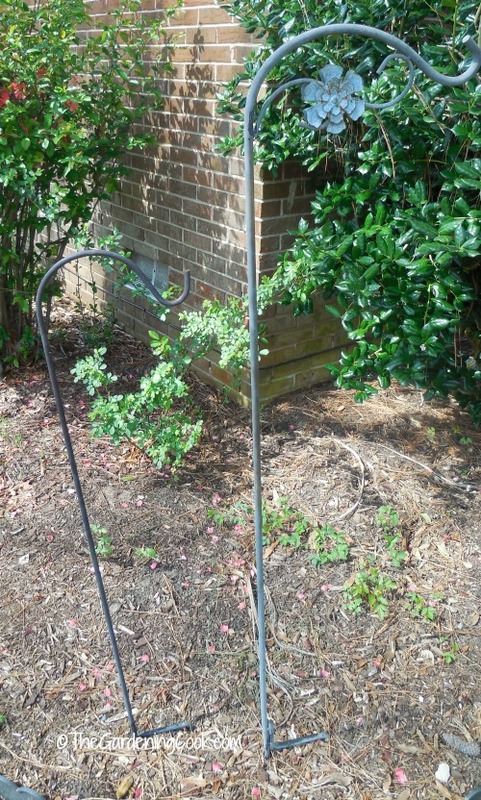 Craig’s list is a great source of plants this time of the year at super cheap prices. Dividing overgrown plants gives you more plants for free. 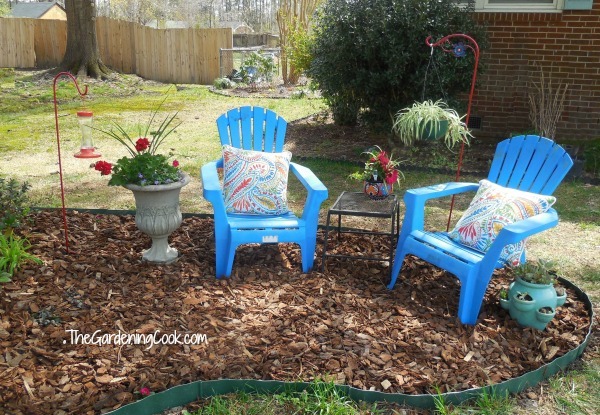 Re purposing old items with some color, like this project, gives them a new lease on life. 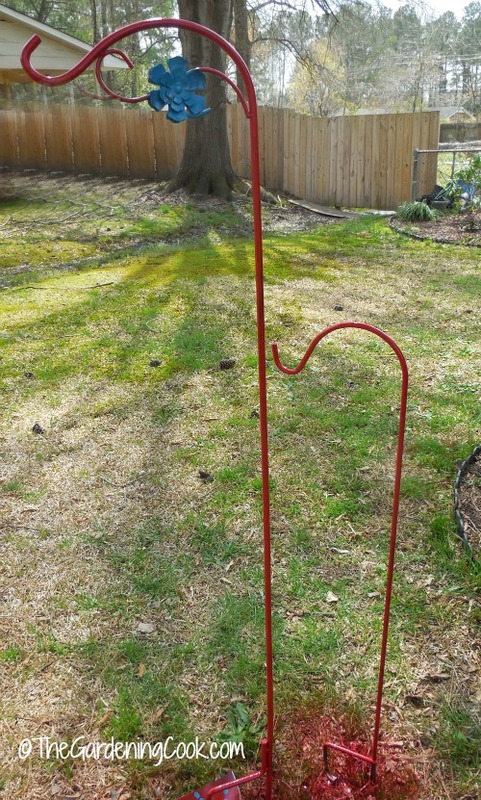 Last year, I found these sale shepherds hooks last year for a couple of dollars. They have been sitting in my back yard since then, waiting for some inspiration. That inspiration came this week, when I decided to make over one of my front garden beds that was worse for wear. 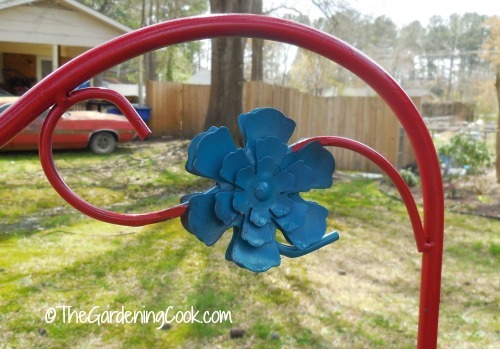 This Yard Sale Shepherd’s Hook had a great flower accent but it needed some color and TLC! I started by setting up a spray paint area. Of course, with my luck, the day was windy. 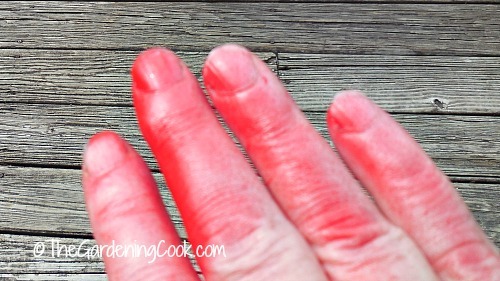 I did not think to put on rubber gloves and the back spray from the wind covered the hand that was holding the spray paint in sunrise red paint! (not to self, go in and get out some latex gloves! Next, I added the purple and yellow to the flower for some extra detail and let the whole thing dry for another hour. Then retouched the flower again. This was not an easy feat. Mainly because I am inpatient. The shepherd’s hooks was not firmly in the ground but still a bit tacky but I wanted to get going on the flower. It was an exercise that felt like I was painting on a rowboat. 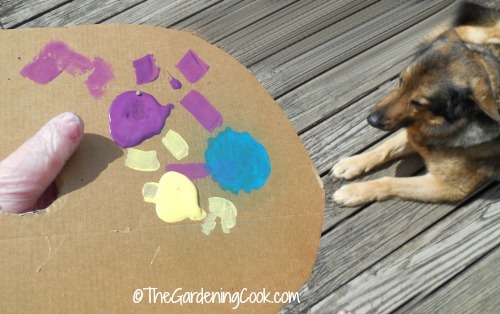 Hint…put your shepherd’s hook firmly in the ground, or wait until the whole thing is completely dry and lay it on a table to do the detail. That is all there was to it. But look at the way they look in my charming seating area make over! The spider plant graces my Flowered Shepherd’s hook, and a hummingbird feeder that my mother gave me graces the smaller one. The sunrise red color is sure to attract the hummers. Now, I just need to go and make some hummingbird nectar and I’ll be all done and ready to enjoy my new seating area. Don’t you just love budget make overs? 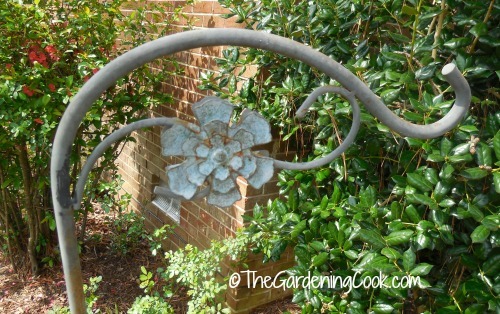 What have you do to re purpose some old garden decor to give it a new leaf of life. I’d love to hear your experiences in the comments below.